WalkFit Platinum Reviews - Improves Your Posture? WalkFit Platinum promises to give your aching feet a relief. With its re-designed arch support and gel cushion, it also claims to improve posture. If you are experiencing foot, joint, hip, or back pain from walking or standing, WalkFit Platinum may provide you with some relief. This specially-designed orthotic shoe insert claims that by re-aligning your feet and ankles, it can adjust your whole body, giving you relief. WalkFit Platinum is brought to you by WalkFit Platinum, a company located in Sherman Oaks, CA. They are not accredited by the BBB and currently have a B rating, due to a complaint about billing issues within the last 3 years. The WalkFit Platinum is a customized orthotic made of hard plastic that fits in your shoe. Recently, the company adjusted the design, adding patented “Nano-Silver technology” to get rid of germs and odor, as well as a gel pad on the heel for greater comfort - now it’s called the WalkFit Platinum! The WalkFit Platinum comes with three adjustment pads - Low, Medium, and High to change the metatarsal arch of your foot. (It is recommended you start with Low.) Remove your existing shoe insert and replace them with the WalkFit Platinums, making sure their heel-end is pressed to the back of the shoe. Adding a stabilized heel cup and lifting and supporting the metatarsal arch is said to cradle the feet for stability, as well as diffuse and absorb shock from running and walking. They also claim WalkFit Platinums will align the back, shoulders, and spine, balance the hips, reduce joint stress, and eliminate lower back pain. WalkFit Platinum has several tiers of purchasing options. You can get 1 pair at $19.95 + $9.95 S & H, for a total of $29.90 - this also includes the lotion, how-to guide, sandal adaptor, and acupressure inserts. Now, here’s where it starts getting tricky. If you want the All in One Foot Care System, add $7.95 S & H for each (up to 3 “free”), and add $9.95 S & H for each pair of WalkFit Slippers (up to 3). Now here’s where it gets REALLY tricky: you can also get “free enrollment” for their Joint Support supplement at the time of your order. If you click “yes,” you will be sent one 60-pill bottle of “botanical and herbal extracts” to help with joint pain. If you don’t call them within 30 days to cancel, you will be shipped another 60 pill bottle and charged $44.85; these shipments and charges will continue every 2 months until you cancel. Note: Choosing the joint supplement is optional and not required for the purchase of the Walkfit Platinum. 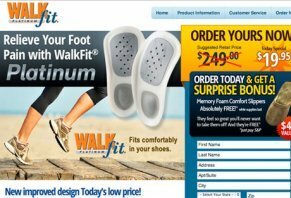 WalkFit Platinum offers a lifetime warranty for their products, simply return them on your own dime, plus pay $5.95 S & H.
Similar to pain located anywhere else on the body, discomfort in the feet, joints, hips, or back, whether walking or standing, is only a symptom—not an underlying cause. And with so many areas of the body in question, these causes could range from arthritis and plantar fasciitis, to sciatica and degenerative disc disease. As such, only your doctor can diagnose what’s generating your pain in these areas, and then recommend a tailored treatment regimen. But if they indicate that an orthotic like WalkFit Platinum might work, it comes from a company with years in business who stands behind their product with a lifetime guarantee. And since writing our original article, four HighYa readers and hundreds of Amazon customers have provided their feedback about the inserts, giving them an overall average rating of about four stars. As such, it seems you might have nothing to lose but a bit of your time for giving them a try. Just keep in mind that, like any pain relief product, not everything will work for everyone. I wore the WalkFit Platinum insoles as instructed but after three weeks I gave up as I ended up with a backache and knee pain. I was fine before using the insoles. Now they are in a cupboard, what a use of money, and now I will have to go see a physiotherapist to fix my back. I can't get my money back as their packing is ridiculous. I had to get extra strong scissors to cut the molded plastic packing. This is how not to be environmentally aware. Thank you for the post. We are sorry that the insoles did not meet your individual needs. WalkFit® Platinum, by Phase 4 Orthotics, provides extra metatarsal and longitudinal support and cushioning for your feet. Our WalkFit® Platinum Orthotics are ideal for complete foot support, comfort, correct posture, and mechanics. Our doctor-designed orthotics are a unique foot support system intended to help relieve over-pronation while preventing foot strain and injury. Designed with a prescription-like arch support, our foot orthotics prevent and treat foot pain. Wearing WalkFit® Platinum Orthotics prevents feet from rolling inward (over-pronation), which can pull the entire lower body out of alignment. Wear them only one hour at first. Orthotics work by changing the position of your feet. It may take some time before you are comfortable wearing them all day. To begin, wear the orthotics 1 hour the first day, 2 hours the second and so on until you can wear them comfortably all day long. If you feel discomfort, remove them from your shoes. Begin wearing them the next day without increasing the time they are worn. Then continue to increase usage until they are comfortable. If you feel pain when wearing WalkFit® Platinum Orthotics, discontinue use and consult with your physician. We are not sure what returning them has to do with the packing, however, you do need to follow the policy of where you purchased them from. In North American, we would accept the return regardless. We suggest that you contact the seller again regarding your return for a refund. I love these orthotics! I've been a user from the original WalkFit orthotics. The Platinum is very comfortable. The WalkFit are much more comfortable than the orthotics I had made at the podiatrists. They only felt good for a week, then the pain proceeded. I would recommend WalkFit to anyone that has heel spur problems. I've worn my WalkFit so much, they are splitting near the heal part. I need to send in for replacement. Or just order a new pair. Great to hear how well WalkFit is continuing to work for you. The insoles have a lifetime warranty. Please make sure to include the size and gender needed on the payment as well. If you want to replace your WalkFit® Platinum Orthotics for any reason, just return them to the address below (with $5.95 shipping & processing), and we will exchange them for free, forever. I would first like to take the time to say thank you! My story is, about seven months ago I started having very bad pain in my left heel. I could barely walk from place to place. Without so much pain. I saw a doctor who gave me the advice to buy $200.00 shoes that would help me. So I wore them about a month and I still had very tender feet. And I started having a limp and slow pace walking. I found out that I could put on a pair of 5" high heels and walk perfectly. Sounds crazy, I know. But you can't wear them everywhere. The pain had gotten so bad I felt like I needed to put in a notice to quit my job. Because I could not walk. One night at about 8 pm I looking for my favorite TV show. There was an infomercial on about WalkFit. I thought when they show me someone talking about planters I will believe it. Well, it came up, and I said "what's the price" (to myself of course). I thought what have I got to lose. I had already bought a pair of expensive shoes. So I ordered them. And I got them and I tried them. The first day I noticed there was pressure off my heel. So I stayed in them for about two hours. Next day four hours, third day completely pain-free. REALLY, I got my feet back! No tender feet or limping. I have energy. I never noticed how exhausted tired hurting feet would make you. I would say to anyone, you need this for yourself. Put yourself first this time and stop trying to cope. Thank you again. Have not received yet, but the over-the-phone checkout process is the worst! I felt like I was being held hostage by the computerized woman on the line. I only ordered two pairs of orthotics, and the dude tried to make me buy into several offers, keeping me on the phone for over 20 minutes. They really need to do away with that option! It was the worst experience ever, and I would not recommend it to any of my friends. Now I'm worried this lady may have charged me for stuff I never asked for, and they don't even give you a balance! I did not even get an order number! Thank you for the comments. We are sorry that our Interactive Voice Response (IVR) system was long. In the future, you can ask for a live agent and a person will come on the line and assist you. We also sell online. We do show that your order was for two pairs of insoles only. We hope that you like the insoles. My feet, legs, and hips have not felt this good in a very long time. I have flat feet. I let a Podiatrist talk me into getting them remodeled. My left foot now has a raised arch due to my tendons being cut and shortened. My Achilles tendon was cut in three places in order to be filled in with scar tissue so that I could pull my foot up and back towards my shin better. Why I need to do that remains a mystery. The result is that I traded my foot and hip pain for a very weird sensation, which involves my leg now. It's a very strange hip-down-through-my-toes weakness/tension feeling that is not acceptable and is worse than the pain that I was experiencing. My right foot is still flat and will remain flat. What the WallFit has done is to make my left foot/leg feel more normalized, like my leg is finally receiving energy again. The first day I wore the WalkFit insoles, and yes I wore them all day, is the first day I wasn't constantly aware of the weak but tense feeling in my leg. I truly wish I had found these before I put myself through drastic unsuccessful surgery. Purchasing these would have been a much smarter choice. I recommend Walkfit Platinum insoles to anyone who has any sort of alignment problem. As far as all that money thrown around when you order by mail, just call the nearest store that supplies them! Target did NOT have them in the South Portland Store in Maine, BUT they did in Topsham. So I left and picked them up there after I ordered them online. Simple! And only $21.00 to pick up with a valid ID, with NO supplement program to be pushed at you. I ordered one order of WalkFit Platinum off their website. It cost me $19.95. I received an email stating they received my order but there was no detailed information including shipping costs and a total. I called the company that day and was told they couldn't find my order, that it takes 2-8 hours to get through my system. I emailed customer service and canceled my order. I never received confirmation of the cancellation. I called the next day and was told they couldn't find the order in their system so it must not have gone through. On day three there's a charge for $99.60 in my checking account that they charged my debit card. I called the company, and the guy was so rude and said the product had already been shipped and I should refuse it and they'll refund my money (less shipping and processing, which he didn't tell me what the charge would be). I asked for a shipping tracking number, and he gave me a bogus number. I even repeated it to confirm it was accurate and it was bogus. I'm trying to work with my bank to reverse the charge but since they said since I placed the order I'm at a big disadvantage. Thank you for the email. It typically can take up to 24 hours for an order to upload. I am sorry that customer service did not let you know this. I did find your order and it is #54837199. We did charge you and the order has shipped. However, I just processed a refund so you should see the money back into your account soon. Please refuse delivery of the order. If you are not home when the post office delivers it, if possible, please take it back to the post office and ask them to scan it back in as refused. The tracking number is 9261293150858750876909. Again, we are very sorry for the inconvenience we caused you. Thank you. Write a Review for WalkFit Platinum!